They say good things come in threes, and Ariana Grande has proven that right: the pop queen dropped her fifth studio album, Thank U, Next, on Feb. 8 and released the third single, “Break Up With Your Girlfriend, I’m Bored,” along with a music video. Not only does the video have us seeing double like a Mary-Kate and Ashley Olsen movie, but it also stars Riverdale hottie Charles Melton, who is truly swoon-worthy. But the most important reveal Grande shook us with? A sample of *NSYNC’s “It Makes Me Ill” in the bridge of “Break Up With Your Girlfriend, I’m Bored.” One of the biggest pop stars of today utilizing one of the greatest songs by one of the most prominent boy bands in history? Her mind! For those who aren’t as well-versed in *NSYNC’s jams (and honestly, why aren’t you? ), “It Makes Me Ill” is from the band’s biggest album, 2000’s No Strings Attached. Grande puts her own twist on the song’s second verse, tweaking the lyrics to, “You can call me crazy cuz I want you / And I never even never f*cking met you / Say I’m trippin’ and it ain’t right / but you without me ain’t nice (Ain’t nice, yeah).” A true musical virtuoso. *NSYNC disbanded in 2002 (with one break to perform together at the 2013 VMAs), but if anything, I feel like this is the perfect opportunity for them to get back in the game. Maybe drop in on one of Grande’s tour dates for a surprise feature? I’m just saying. 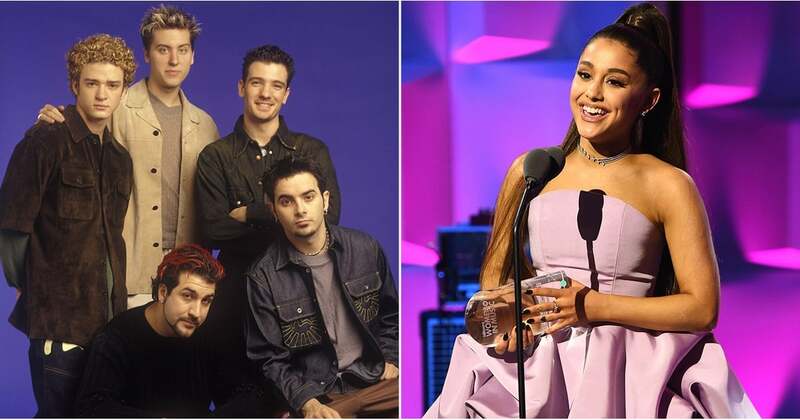 Check out the two songs ahead so you can compare, as well as some reactions from Grande and *NSYNC fans who are probably overwhelmed by the greatness of this single and need several minutes to get their bearings.